The Max air blower range from Air Supply of the Future are slightly less common than the more popular Ultra 9000 model, but is still the blower of choice for many hot tub manufactures. The newly designed housing draws air in from the base of the unit which creates a path to trap noise inside the blower. This creates one of the quietest blowers on the market with decibel ratings as low as 65dB. This intuitive design also helps the motor to run cooler and when installed in a typical hot tub application you can expect up to 30% more pressure output than comparable models with similar hp ratings. Supplied with an amp cable. 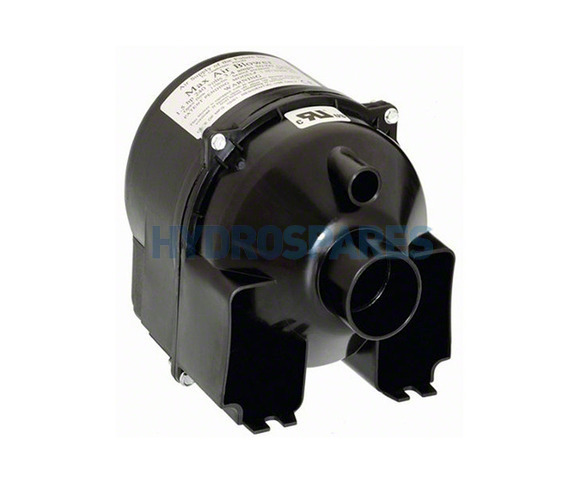 A carefully positioned non-heated blower in the hot tub cabinet will draw warm air from pumps and heating equipment. Maximum recommended blower size for 1.5" pipe 1.0hp. You may need to re-use the cable from your old blower instead of the cable supplied.